Hailing from the birthplace of techno, Jason Wilkins, or DJ Jay 1, 2, is a legend in these parts, with weekly gigs spinning new and old music for his devoted following around Beijing. Growing up in Detroit, Michigan, he initially made his way to Beijing in 2007 working for Microsoft, but decided to become an art teacher and spread his knowledge about creativity to Beijing’s local and international youth. As he is no stranger in shaping young, pliable minds in the area of cultural appreciation, we organized a little lecture for him at Beijing No. 55 International School, so that these kids could meet a real working DJ. By real, we mean this guy has over 4,000 records in his collection, that span just about every genre imaginable. After all, there’s a reason why these bulky black discs are still the format of choice for many disc jockeys, and DJ Jay 1, 2 is living proof of this esoteric art form. Robert, Grade 7 (US): Do you like any rappers that are making music nowadays? Jason: I like rappers with something to say, like J. Cole, Childish Gambino, Vince Staples, or anybody positive. But, if you’re asking me about some other artists with nothing really positive to say, then you will never catch me listening to it. Emma, Grade 9 (US): How do you get people to feel the music you are playing? Jason: If I’m playing a party and someone says they want it to be a funk party, I’ll probably pack a majority of records that are funky. So I’ll usually go to the party with that in mind, but I might play another different type of song, and they might really be feeling it and start to dance. That’s when you have to read the crowd. Alex, Grade 11 (Korea): What do you think are the similarities between art and music? Jason: They call musicians artists. It’s all about what you create. Everything starts as a blank canvas, like a painting or this vinyl disk. It’s all about what you put on it. 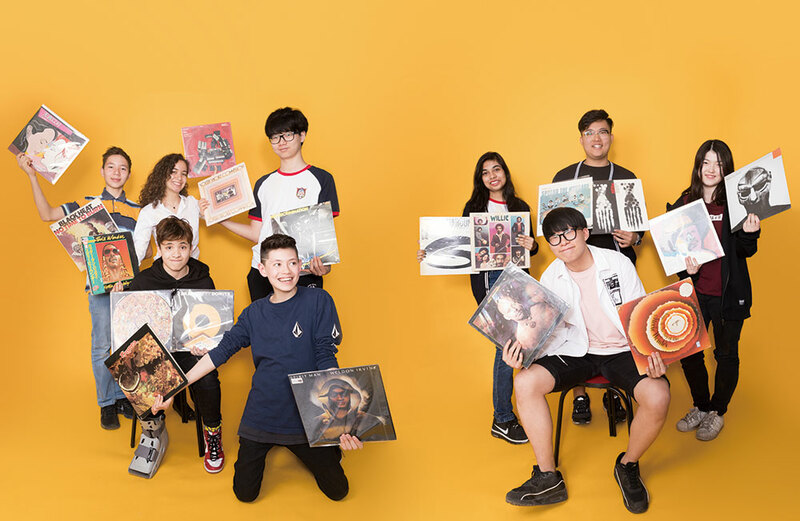 Martin, Grade 11 (Korea): What inspired you to go from DJing to creating your own music? Jason: The same inspiration that came from me DJing. What got me into making music, is that I wanted to hear what I could do. So, I got some software, tinkered with it, and when I became confident enough, I invested in myself and pressed some records. Aidan, Grade 9 (US): What era or style of DJing made you want to give it a try? Jason: I’ve been DJing for a long time. When I first came into it, it was more about playing house or techno. Coming from Detroit, that was all around you. But then I started getting into hip-hop and going to those parties, which led me to explore more funk, soul, and disco. Sabah, Grade 10 (Bangladesh): If you never got into DJing and collecting records what would your life be like now? Jason: To be honest, I think my life would have been the same except for I wouldn’t have been thinking outside of the box from such an early age. Seung Je, Grade 9 (Korea): How does the music you play make you feel? Jason: It is gratifying to me! I don’t play for the crowds, no matter what genre. I don’t play music with the intention that I’m going to only please a crowd. I play a song that I want to hear, and it just so happens, without trying to sound arrogant, that other people like it as well. Jennifer, Grade 11 (Venezuela): Why do you only listen to music on records, and what do you feel is lost by people switching over to streaming music? Jason: When I look at a turntable, I look at it with fondness. I can say that this machine has been my best friend. When it’s playing, I look at it like it’s talking. When it gets to the end of a song, I’ll get up and turn it over and put the needle back on so that it can continue with what it’s trying to tell me. Dmitry, Grade 7 (Kazakhstan): Do you only listen to your music on a record player? Jason: Yeah, at home I’m making lesson plans and listening to records. When I’m out and about, I’m not even listening to music as I’m probably working.